How would you value a well used First Flap? I'm interested in some opinions here. Note I am not offering this item for sale nor am I brokering it. Just looking for some opinions on both valuing scarce but used cloth and whether you feel a similar item would find its way into you possession. I was recently contacted by a ex-Scouter who had what appeared to be a Wakpominee 48 F1 in well-used condition. It had been sewn, washed and exhibited at least some box-dirt but overall was still in decent but not great condition. It is a First Flap with I believe a 9 scarcity on a scale of 1-10. He asked my opinion about value I had 6 information points: Tracker Software lists 3 sales by TSPA @ $454, $ 810 and $ 1750 with no mention of condition which would normally mean mint. From 2 old sale lists from Brush Creek, (3-4 years ago) one F1 was described as very lightly sewn @ $900 and about 4 years ago another "crisp" 48F1 offered @ $800. One price realized list circa 1992-93 from the sale of a very large NY collection (Don Vanderbilt) listed a 48F1 as selling for $777. Now overall there may have some appreciation or overall decline in value, but assume $1000 current value as a talking point for a mint 48F1. 1. How much of a percentage discount from a mint specimen would you think would be justified for the used flap pictured above? 2. If there was a similar valued item with a similar scarcity (and condition) from one of the lodges/councils/ areas you collect would you be willing to put it in your collection in that condition? 3. What about if this was the last item you need to complete your prime collection? Would a used item do or would you hold out (and pay) for a mint one? 4. What percentage discount from "mint" would you value a used item at? I'd be interested in your thoughts. You may email me or leave a comment here. 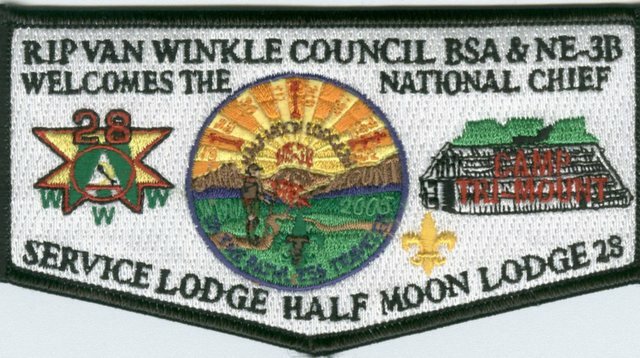 Half Moon Lodge #28 issued a 2005 Jamb-O-Ree Prototype Flap designated the YS3. It is similar in design to the approved S30-32 series, but with a White Background. 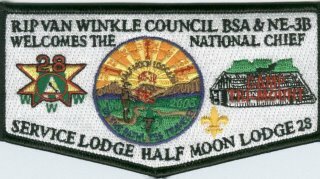 Half Moon Lodge issued a service Lodge flap when it hostd the NE-3B Conclave in 2005 the S29. There was a prototype of the flap made witha white background. 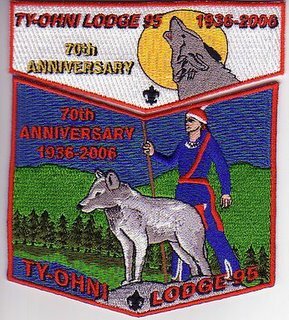 Last week I posted that Ty-Ohni Lodge was planning a 70th Anniversary Set and provided an artists rendition (see link below). 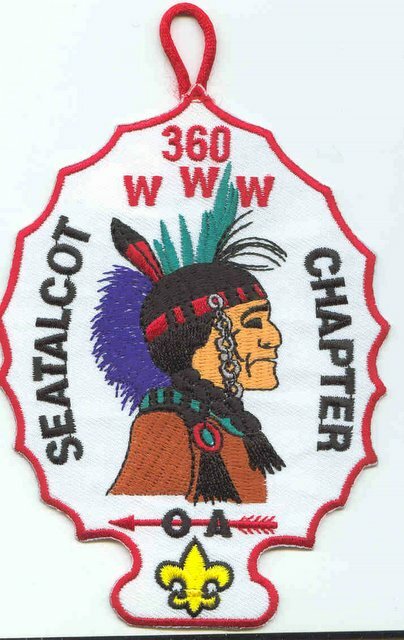 The issue below was incorrectly listed in the Blue Book as belonging to Shinnecock Lodge #360 Nathan Hale Chapter and designated the er1986. 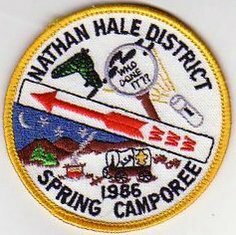 It is actually from Eluwak Lodge #59 Cochipiane Chapter of the Nathan Hale District and already listed in the Blue Book. You Shinnecock completeists can take this one off you list. Here is a scan (not a great one. 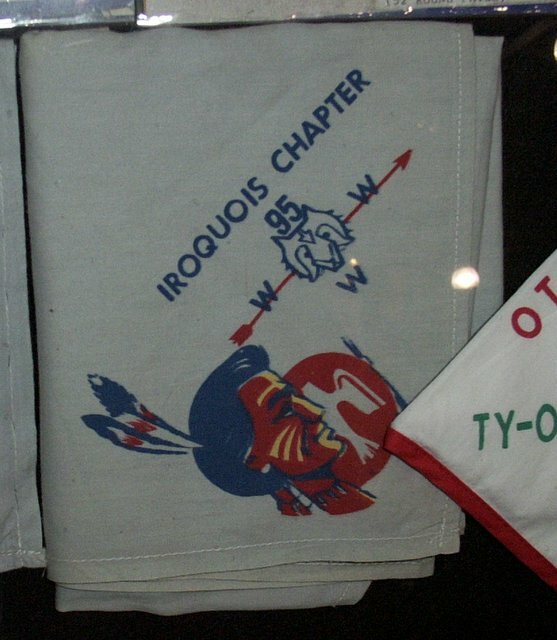 but all I have) of a previously unlisted Buckskin Lodge #412 event neckerchief. Another picture from Rob Cunningham of the Iroquois N1. While this has previously been listed in the Blue Book, the colors were unkown since the only copy I had seen was from a black and white photocopy from the Don Vanderbilt collection. Rob Cunningham brings word of a previously unlisted N2 variation. The primary difference is the arrowhead gray (N2a) or Light Green (N2b). Will also update the N2 description as well. 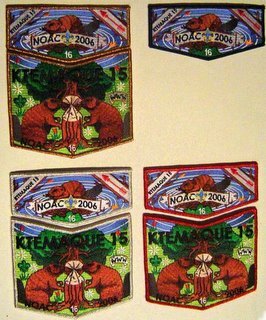 Ktemaque Lodge is issuing a series of 7 patches for the 2006 NOAC. A Single Flap and three 2-piece sets. The sets all share the same design with different border colors RMY, SMY, GMY. 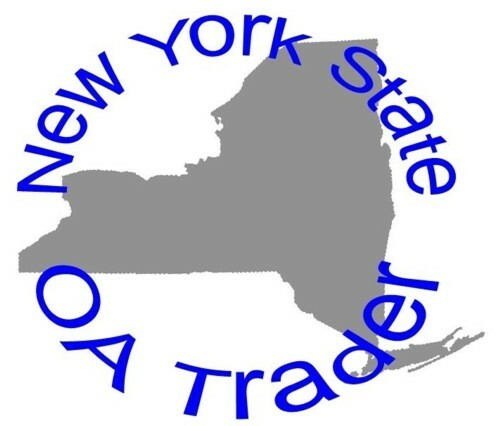 Once I have more information, I will post it, but they are some variation of Fundraiser, Trader and Delegate. The single flap is of the same design with a Black border. Jim Chamot passes along an artists' rendition of a new 2-piece set from Lodge 95 which is scheduled to be released shortly. Will post a scan with BB details when available. Brain Petrowski passes along some information on a Trade-O-Ree Buckskin Lodge #412 will be hosting this spring. 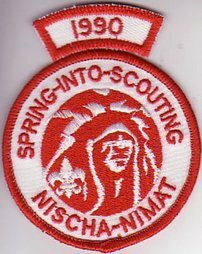 "Just wanted to let you know that Buckskin Lodge #412 will be hosting a Trade O Ree to raise funds for our contingent going to NOAC this year. Buckskin Lodge #412 Trade O Ree Saturday 4/01/2006 St. Thomas the Apostle School 24 Westminster Road West Hempstead, NY 9am-3pm Admission: Free Table Fee: $15 for first table and $10 each additional Contact: Doug Makosky mmakosky at optonline dot net Contact: Russ Rensch superscoutruss at optonline dot net There will also be a Merit Badge midway and many activities for kids as well as a live auction at the trade oree. All proceeds will go toward our contingent to 2006 Noac. Food and beverages will also be available for purchase." Bruce Raver recently reported on Patch-L on the merger (absorbtion) of Adirondack Council into Twin Rivers Council. For those who have not yet heard, Adirondack Council and Twin Rivers Council have merged. Below is the text of the article in the latest issue of the Twin Rivers Council newsletter "Signals" sent to adult volunteers. Adirondack Council's area will become the Adirondack District of Twin Rivers Council. Perhaps it's more accurate to say that Adirondack Council was "absorbed." I have not heard anything yet about the impact to the lodges. When Wakpominee Lodge 48 merged with Ganienkeh Lodge 19 in 1998, they became the Wakpominee Chapter of the new Haudenosaunee Lodge 19. 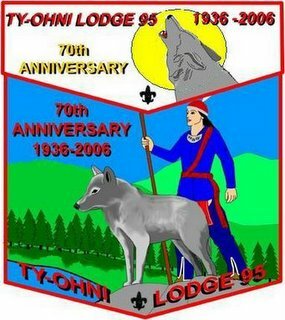 No telling what the youth members will decide on, but a new lodge name could be in the making. I'll post additional news as it becomes available. 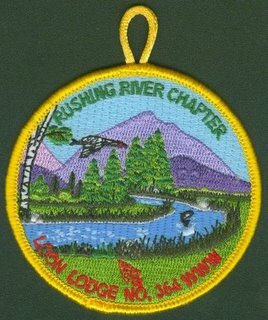 An interesting side note for numbers people: Loon Lodge 364 coincidentally shares the same number as the Twin Rivers Council (#364), so maybe Loon won't completely lose its old number if lodges are known by their council number! The old Adirondack Council Webpage now is renamed Adirondack District with a link to the Twin Rivers Council homepage. 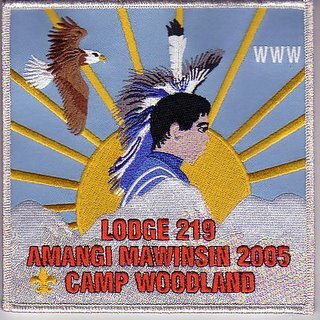 No news on the Loon Lodge website or the Haudenosaunee Lodge website at this writing. Newly discovered Shinnecock Lodge Chapter issues. 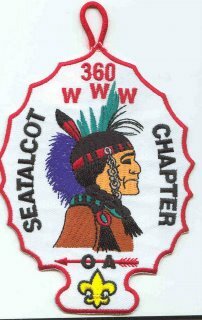 Below is a previously unlisted round and event rocker from Shinnecock Lodge 360 Pwamas Chapter. 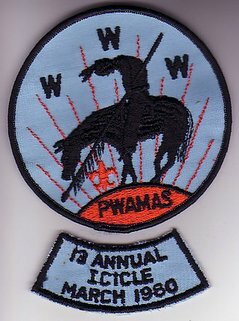 eX1980 BLK R LBL - - BLK 13 Annual Icicle March 1980 TLS 83mm (widest) x 31mm tall ARC for R1.5 does not mention chapter name.